Yes, there is more we like about Alberta than the food, as discussed in the AA Part 1 post (for new readers, that’s “Alberta Advantage” not “Alcoholics Anonymous”). Maybe what we are going to miss the most (except for the people we are leaving behind) is Jasper. OK, so we aren't trying to single out those from central Alberta as the only in-breds in the country. There will soon be a post on the Bruce Peninsula, where Dan grew up, in Ontario. Not being from Rocky Mountain House (sorry KM! ), we don’t have enough fingers and toes to count how many times we have been to Jasper. Jasper is a 4-hour drive from Edmonton, and almost everyone who has come to visit us has made the trek, some more than once. It is one of the most spectacular places in the world – the scenery is beyond description, and it just “feels right”. Dan’s opinion has always been that the moment you cross into the park, your blood pressure drops by 50%. Sure, you have to drive through Edson and Hinton to get there…ugh, are there worse cities on the planet? Probably not…but Jasper is an oasis in the gem of Alberta. On one trip back from Jasper, we took the very long route down the Icefields Parkway, and out the David Thompson Highway. Along Lake Abraham, it is beautiful, but you end up in Rocky, which is right up (down) there with Edson and Hinton. So no matter how you try to get there, it is a challenge to the senses. 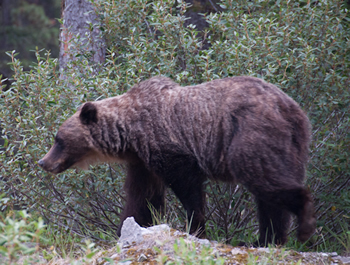 When you are this close to a grizzly, you think more about an exit strategy than focusing the camera. In one weekend last summer we saw several bears (including a grizzly so close that Lisa was worried, even though we were in the car that we are now trying to sell! ), and a pair of young marmots playfighting. How many people can say that? Young marmots play very much like our cats, Malachi and Lester; it looks like they are trying to kill one another but really it is just play. Unlike cats, however, they shake hands like boxers before attacking. December 26, 2010, summer in the southern hemisphere. Cape Horn in middle of summer is not as warm as Jasper in summer. We are pretty well traveled. Dan has been to Europe more times than even someone from Rocky Mountain House (or Tobermory, for the Ontarians) can count on one foot. Lisa has been there more than most of them can even count. We’ve seen central America and the Caribbean; we’ve been to Australia twice, so far; this winter we rounded Cape Horn; and now we’re re-locating to a gateway to explore the south Pacific. But honestly, it can’t get any better than what we have had in our backyard for the past decade. This is supposedly in Vegreville, but we didn't see it the one time we drove through town. I guess we blinked. What is Peace Country like? Is Frank Slide really haunted? Does Vegreville really have the world’s biggest pysanka? Are there parts of Hinton that don’t smell like a pulp mill? Is Medicine Hat really the world’s biggest trailer (Aussies, read caravan) park, metaphorically speaking of course? Which is the better way to die in Fort Mac: drug overdose, STD, or drowning in a tailings pond? OK, so maybe not as nice as Jasper, but the mountains in Banff are still pretty sweet. We’ve been to Drumheller, but never south east of Calgary to experience the Canadian prairies. We haven’t make it north either. Alberta is a lot of flat land, except for the western border that is the mountains, and every year when deciding where to go for a local holiday, we would ponder all different parts of the province, and then come to our senses and head back to the mountains. Australia doesn’t have real mountains. We’ve been to the Blue Mountains, to the west of Sydney. They are nice, but they are ‘plateau’ mountains – about 1000 metres high, but flat with ravines instead of peaks, and you can drive across the highest point. We’ve been to Tamborine Mountain, southwest of Brisbane. Beautiful spot! At the edge of the Riverina, there are the Snowy Mountains, which we will visit, eventually. It actually does snow there, but we doubt they will be really special compared to the Rockies. The Australian ranges are more like the Grampians or other mountains in the Scottish highlands (one of our other favourite places) – beautiful, but more like the Alberta foothills than “real” mountains. Then there are Blue Mountains in Ontario…tiny, not really mountains but they tell people they are to attract skiers from Toronto. * this is not to say that BC wine is bad; there are some really great ones (Blue Mountain pinot gris, for example, or on our last trip to Vancouver we had a really great cab franc from Fort Berens winery in Lillooet). But Air Canada lounges at Canadian airports typically have two reds and two whites, none of which are enjoyable. They are sufficient to put you to sleep for a long flight and far superior to the plonk they give you on the plane, but that’s about it. In contrast, the Air New Zealand lounge at the Sydney airport (that AC/Star Alliance elite get to use) has a spectacular selection of 6-8 Aussie and NZ reds and another 6-8 whites, and a self-serve pancake machine. Yes, you read that right, a pancake machine. This entry was posted in Australia, Canada, mountains, small town culture, Uncategorized, wildlife. Bookmark the permalink. Maybe you shouldn’t wear sandals to work.